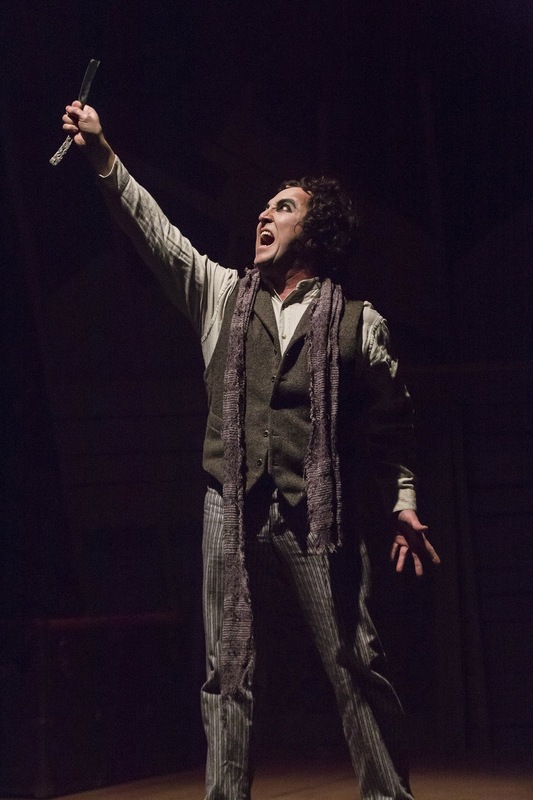 Actors Theatre of Indiana, Carmel, opened the much-anticipated Sweeney Todd: The Demon Barber of Fleet Street production this weekend. Familiar to fans of Stephen Sondheim, musicals and Broadway hits; the story became even more well known with the 2007 hit film Sweeney Todd: The Demon Barber of Fleet Street starring Johnny Depp. As good as the movie is, there are some stories which are best to experience via live theater ~ this is one of those shows. 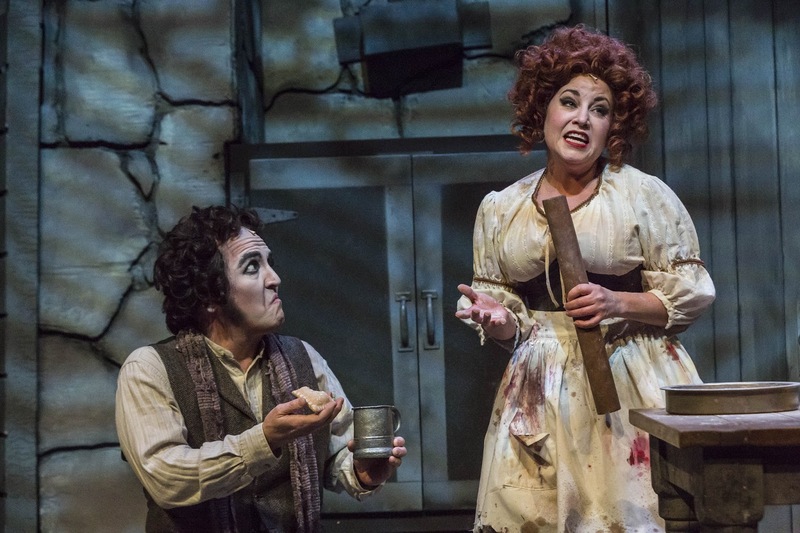 Don Farrell takes on the title role of Sweeney Todd, in the black comedy with a sensationally sinister performance. Keeping the murderous role from becoming simply a serial killer on the loose, Farrell brings a vulnerable side of his character to light during, "The Barber and His Wife," allowing the audience to witness the happier youthful version of himself prior to losing his wife and daughter to the corrupt local Judge Turpin (Paul Nicely). Accompanying Todd in his razor-sharp removal of loathsome people is Mrs Lovett, played magnificently by Judy Fitzgerald. Fitzgerald portrays the pie-making enabler with absolute abandon, sharing her contagious delight in the creative solution of her floundering meat pie cafe and Todd's need to slit throats of unworthy folks. 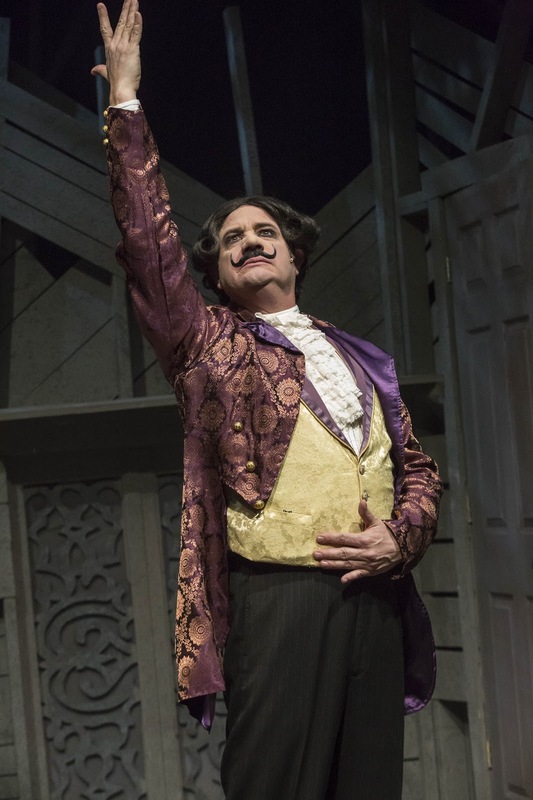 John Vessels is a pure delight as Adolpho Pirelli, the self-proclaimed, "King of Barbers," creating a larger-than-life caricature with his comedic talents. Vessels proves his vocal talent, as well, in the first victim's solo, "The Contest." Caleb Wertz plays Tobias Ragg, abused waif and assistant to Pirelli then Lovett, with a maturity beyond his years. Craig Underwood takes sleazy to a new level with his portrayal of The Beadle. 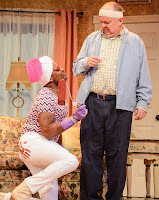 The entire cast of this production is seamless and smooth, both in working with each other and portraying their individual characters, with all but the two leads portraying more than one character during the two-act play. Bottom Line: Sweeney Todd is the best show I have reviewed at Actors Theatre of Indiana and is an absolute must-see for anyone in the Indy-metro area. 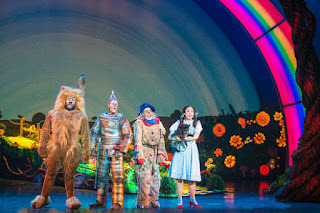 Broadway in Indianapolis brings flying monkeys, melting witches and a scary forest to the stage at Clowes Memorial Hall, Butler University. Running through Jan. 17, Wizard of Oz opens to a packed audience. When a live version of a film classic is attempted, it is perfectly natural to feel trepidation. Will it have the original score? What will be chopped out and what will be updated to the point of destroying that which made the show popular in the first place? Relax. They nailed the song list, characters (minus the Lullaby League), and even have a rainbow or two. Playing the wise-cracking, adorable Scarecrow is Jay McGill. The man of straw, in this modern version, is less about trying to prove his intellect and more like Dory from Pixar's "Finding Nemo" ~ adorable and ditzy. Morgan Reynolds gets everyone's attention as the Tin Man, the minute he opens his mouth to sing his character's song of woe, "If I Only had a Heart." A surprise insertion is after intermission when the witch is melted and the enslaved Winkies show their happiness with a killer dance sequence. A great addition to an otherwise quick scene, showing why remakes can be good. Shani Hadjian cackles as good as Margaret Hamilton as the Wicked Witch of the West. She also brings out her girly side when she sings one of five new tunes, "Red Shoes Blues. 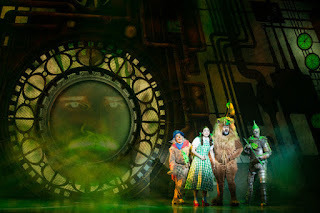 Certainly this production feels as if has been given a "Wicked" once over, in regards to one-liners and asides to the audience. This only serves to enrich the show bringing to a modern end, staving off any chance at a verbatim stale remake of the MGM classic. Bottom Line: Broadway Across Indianapolis' Wizard of Oz brushes up the film classic endearing it to a whole new generation. Beef and Boards Dinner Theatre, Indianapolis, opens its 43rd season with the return of a previous successful production: Run for Your Wife. 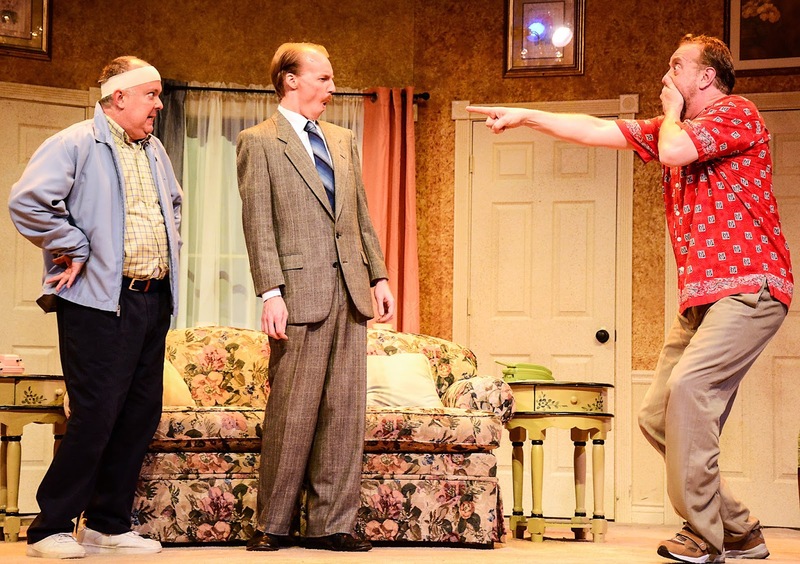 Continuing with its tradition of opening the new schedule with a comedy (typically a British farce), the 2016 season is no exception. The slapstick is set in 1985 London with John Smith (Eddie Curry) a cab driver. An unassuming, congenial man, Smith is portrayed brilliantly by Curry once again to the delight of the audience. Playing the understandably nervous driver is a dead-on role for Curry whose other roles have included a Baptist minister, the unwizardly wizard of Oz and Clarence the Angel without Wings. As the story unveils Smith has not just one wife, but two ~ living within just a few miles of each other, Curry makes you believe he is not a bad sort at all. In fact, you find yourself feeling sorry for the poor guy. Sarah Hund steps into the role as one wife (Mary Smith), while Erin Cohenour takes on portraying the other wife (Barbara Smith). Hund's talents are well known in Indy, and shine once again in this show. Jeffrey Stockberger brings his own comedic talents to the role of Stanley Gardner. Curry and Stockberger have been paired in many a comedy together on the B&B stage over the years giving them a polished rhythm. 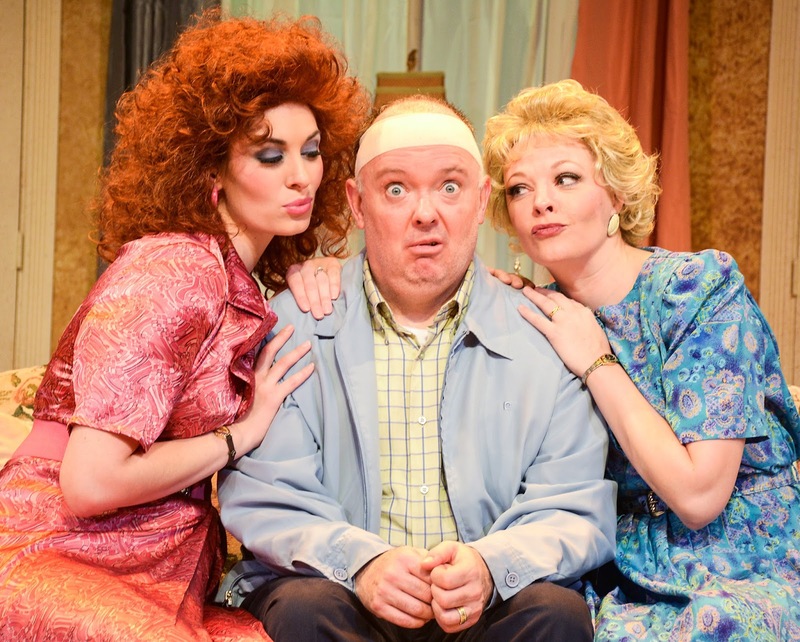 Stockberger seems to enjoy this role even more giving additional energy to the part of the shocked friend. Bottom Line: Beef and Boards opens to a packed house with Run for Your Wife ~ and for good reason. It is a family friendly winter-blues beating show.